This lab will serve to get the Arduino environment set up on your laptop and to familiarize yourself with building circuits around the arduino hardware. 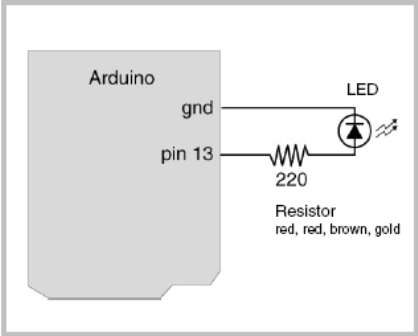 We will be using pre-existing code and the arduino board to control an LED and make it blink. Go through the initial tutorials on setting up the Arduino environment on your laptop and to complete the blinking LED lab. Instructions for different platforms are available directly at http://www.arduino.cc. Here are direct links to the more common platforms: Windows, Mac OS X. and Linux. Submit your report using the Post tab on this website. Remember to use the Category lab01 and the tag of your username. (Note: It’ll probably look very much like the one we showed in class. That’s okay. As long as it has your own photo in it.). Be consistent and always use the same color for source and for ground. This helps prevent errors.